Anja Rubik, classe 1983, è una modella polacca, la cui carriera inizia nei primi anni del 2000. Volto di numerose copertine di riviste di moda importanti e di campagne pubblicitarie, ha sfilato ininterrottamente, e continua tutt'oggi, per le più note case di moda al mondo. Attualmente è una delle top model più importanti e pagate al mondo. Anja Rubik, born 1983, is a Polish model, whose career began in early 2000. Face of numerous covers of major fashion magazines and advertising campaigns, she has paraded uninterruptedly, and continues today, for the most famous fashion houses in the world. She is currently one of the most important and paid top models in the world. Amazing blog and post, I'm a new follower ! I hope you can come visit mine soon ! Love the jacket! :) Great post! I like her style. Her husband Sasha Knezevic is also a model - such a lovely couple!!! She has incredible style! I love it! I like the first 2 pics of her! The first one is the best though! I LOVE her leather jacket in the first one! So rock n roll ! Anja is beautiful and she has PERFECT legs! Lucky girl! Great post! Anja is such a huge inspiration. she's an amazing woman! Thank you so much for the sweet and supportive comment on my blog! It really means the world! She sounds like a very inspiring person in the fashion industry. And darn it she's hot. Thanks for the comment on my blog!! Visit again soon! She's so effortlessly stylish!However,the simple over sized white shirt with the black leather pants and the animal printed pumps has to be my favorite! Ahes is sto stylish, great inspiration!!! love her style and those jackets are gorgeous!!! Can I please have her leather jacket? It's freaking amazing. She is Looking so beautiful and gorgeous,love her style and those jackets are gorgeous! A women can present herself perfectly well as compare to men. Congrats! 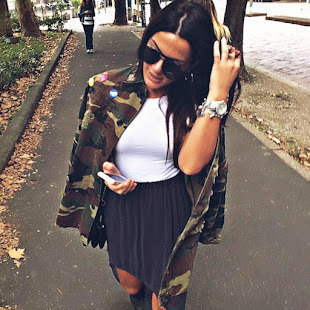 Love your blog, cute outfit.